Portrait of Charles Luther Burton by Cleeve Horne (1912-1998). 1952 Oil on canvas. Private Collection. Raised in Pickering Township (Green River), Burton was President of Robert Simpson Co., Toronto. Image from the Ajax Public Library Digital Archive. Charles Luther (Charlie) Burton was an ambitious and energetic man who was born in 1876 in the village of Green River, in Pickering Township, where his father kept a general store. His mother, Eliza Barclay Burton, shared the job. She was a whole-hearted housekeeper and had to keep not only her home, above and in the back of the store, but also the store. It was only her sense of order and cleanliness that kept chaos from descending upon the store, as it always threatened to do in those old days when barter brought as much produce into the store as it took out. According to Burton1, “it was from her veins as well as from her tireless demonstration, that I acquired the respect for housekeeping which stood me the greatest service in the long years of merchandising ahead of me. You cannot operate a great department store unless good housekeeping is in the forefront of your mind, all day, every day”. Following his family’s move to Toronto in 1888, at age 11, he entered what is now Jarvis Collegiate. After a year or two he was diagnosed as being much in need of glasses, the obtaining of which transformed the rest of his life. At age 14 he had to leave school because the family could no longer support him. His first full-time job was with an Attorney’s firm. Seeing only slow prospects of advancement, he joined a prominent wholesaler, H.H. Fudger in 1891. This proved to be an excellent move for this intelligent, hard-working young man. In 1897 Robert Simpson, the founder of the Robert Simpson Company died and his business was sold to a syndicate of three Toronto businessmen, one of which was H.H. Fudger. Burton was now an employee of the Robert Simpson Company. From there on his advancement was formidable. In 1912 he became assistant general manager, then under the directorship of H.H. Fudger. 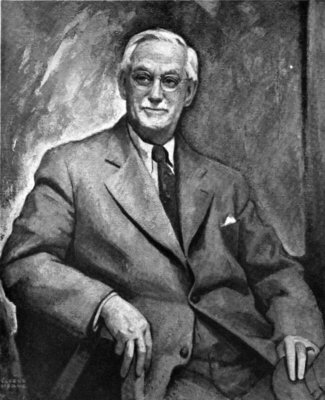 By 1929 Burton was president of Simpson’s, becoming chairman of the board in 1948. During these years, he had built up a great Canadian retailing organization that had few equals in the world. 1. C.L Burton, 1952. “A Sense of Urgency. Memoirs of a Canadian Merchant”, Clarke, Irwin & Company Limited, Toronto. C.L. Burton is the first cousin, twice removed, of the author of this presentation. Northumberland Today columnist, Cecelia Nasmith, incorporated Jim's story with two others under the headline "Professional success is worth celebrating" in the 28 Feb 2013 edition. It can be read online at NorthumberlandToday.com. Google search on "charles luther burton" returns over 3300 results. A photo of Jim with his presentation and the NorthumberlandToday.com article appear near the top.